Many common items you use everyday are manufactured using rosin-based compounds. It’s very likely that a number of these compounds were made by Mobile Rosin Oil Company. Mobile Rosin Oil Company uses rosin and its allied family of products to serve a number of industries including rubber, paper, paint, preservatives, construction and lubricants. Our company was established in 1924 in Mobile, Alabama. At that time, pine chemicals, chiefly rosin and rosin oil, were just finding their way into broad industrial application. Mobile’s advantages were twofold. 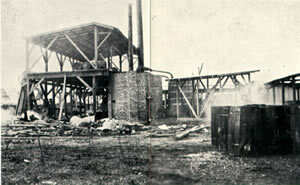 First, longleaf and slash pine trees were abundant, and had supplied the “naval stores” industry since colonial times. Second, Mobile is an international seaport situated at the base of an extensive river system. This allowed us to take full advantage of the explosive demand that lay ahead for our products. We first distributed our rosin oil products for use in the manufacture of axle greases. But with the rise of the automobile, the rubber manufacturing industry quickly became, and remains, the largest consumer of our proprietary blends. This is because rosin oil is an excellent tackifier and processing aid in rubber manufacturing. Demand for rosin oil spurred new and less costly means of production. Today Mobile Rosin Oil Company has expanded into proprietary chemical manufacturing in order to serve a growing number of specialized client needs. Our laboratory technicians customize pine chemical products for highly specific industrial applications. Our company is located on the same tract of land where we first began operations in 1924. Yet we’ve grown to serve clients across America and the world. We attribute this solid growth to solid performance. Year after year, our clients come back because we perform.